One of our popular product lines here at Event Hire UK is our range of patio heaters for hire, and they are popular not just for summer events but also for events throughout the year. For events in winter, spring and the autumn, for example, event organisers might want to hire patio heaters so that they can provide an outdoor area at their venue, whether this is a designated smoking area or maybe a covered seating area with outdoor rattan furniture where guests can go and enjoy some fresh air and a more quiet and relaxed atmosphere, away from the hustle and bustle of the live event. In the summer, of course, with many outdoor events taking place, event organisers rent garden patio heaters to fire up when the sun goes down to take the chill off the air. This might be on a terrace, in an outdoor area in a park and so on. You’d expect that patio heaters can only be used outside, and that is exactly the case for our LPG gas patio heaters for hire. In terms of styles, we offer our Paris outdoor patio heaters and Barcelona gas patio heaters, as well as our super-stylish pyramid patio heaters which look fabulous out front of a venue. However, we also offer an indoor patio heater (pictured) which is electrically powered and is perfect for those large venues which want to provide some warmth for their guests – especially in those high-roofed venues which can be a little on the draughty side! If you need to rent patio heaters for your upcoming event or occasion, don’t hesitate to contact the outdoor furniture hire specialists here at Event Hire UK. 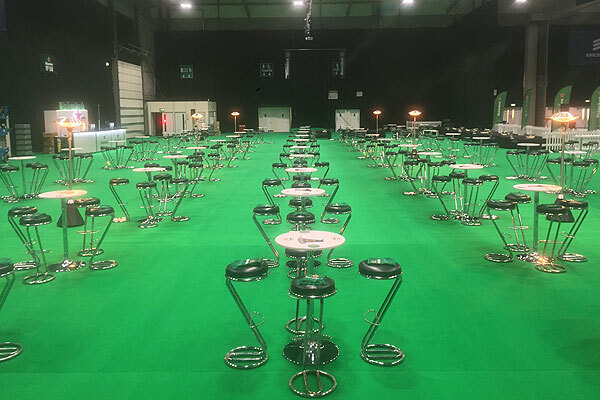 We offer the complete range of furniture hire, catering equipment hire, cutlery hire, crockery hire and glassware hire to event professionals and members of the public up and down the country and so find out for yourself why we are the nation’s favourite event hire company.